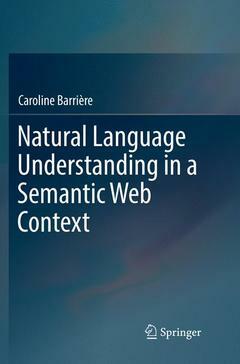 This book serves as a starting point for Semantic Web (SW) students and researchers interested in discovering what Natural Language Processing (NLP) has to offer. NLP can effectively help uncover the large portions of data held as unstructured text in natural language, thus augmenting the real content of the Semantic Web in a significant and lasting way. The book covers the basics of NLP, with a focus on Natural Language Understanding (NLU), referring to semantic processing, information extraction and knowledge acquisition, which are seen as the key links between the SW and NLP communities. Major emphasis is placed on mining sentences in search of entities and relations. In the course of this “quest", challenges will be encountered for various text analysis tasks, including part-of-speech tagging, parsing, semantic disambiguation, named entity recognition and relation extraction. Standard algorithms associated with these tasks are presented to provide an understanding of the fundamental concepts. Furthermore, the importance of experimental design and result analysis is emphasized, and accordingly, most chapters include small experiments on corpus data with quantitative and qualitative analysis of the results. 1 Introduction.- Part I Searching for Entities in Text.- Part II Working with Corpora.- Part III Semantic grounding and relatedness.- Part IV Knowledge Acquisition.- Appendix A A look into the Semantic Web.- Appendix B NLP tools, platforms and resources.- Appendix C Relation lists.- References. Caroline Barrière is a senior researcher at the Computer Research Institute of Montréal (CRIM). Earlier, she worked as a research officer in the Interactive Language Technologies Group at the National Research Council Canada, and as an associate professor at the University of Ottawa’s School of Information Technology and Engineering. Her main research interest is on knowledge representation and automatic knowledge extraction from text. She is particularly interested in the interrelation between natural language processing and the semantic web, with special focus on relation extraction, word sense disambiguation and specialized language analysis.